Reflekt Audio has created a plugin for producers and music makers everywhere. 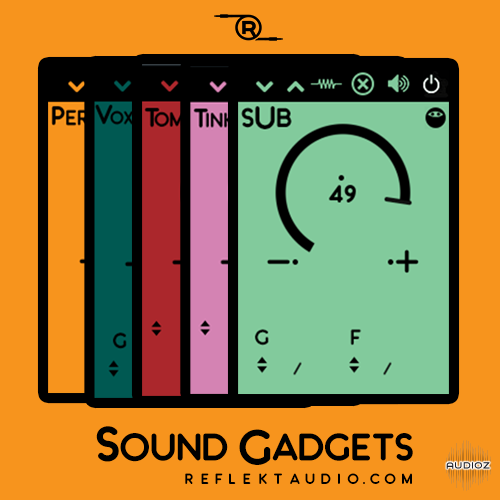 We are proud to present you all with the Sound Gadgets plugin. Equipped with 20 different velocity sensitive sound gadgets you will get everything you need to create music right after download. We designed this plugin to be a go to for modern music makers as it contains one of each element such as a snare, a kick, a sub bass, an 808, a piano and much more. Are you interested to see what these plugins look like? Be sure to view our demonstration videos and images below to see what they visually look like as well as how they audibly sound.We can assure you that you will not be disappointed. Oh did we mention these gadgets are also 100% free? Yup that is correct! 100% free! We are confident you will love and use these awesome little gadgets time and time again. So why not pick up a copy for yourself today? ● Essential Effects Per Sound Gadget. ● Works In Most D.A.W.S. ● Not Compatible With Pro Tools. sorry, but no. the easiest plugin made in a couple of minutes (*except gui) in maize sampler. sounds cheap. maybe it will only be useful for a bedroom beatmakers.